Three hundred people attended a dance to choose Miss Ballyclare in May 1959. The competition took place at Abbey Hall. The winner was 16-year-old Hanna Walters, from Ballynure. 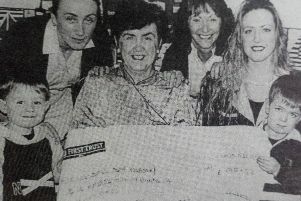 Runners-up were Sandra Hill and Ena Boyd, both aged 16, and from Ballyclare. Among the judges was Miss Larne 1959, Miss Gourley and Mrs M. McCrudden, Ballyclare’s Most Glamorous Grandmother. Meanwhile, a May Queen and “Top Ten” dance was organised by the Army Cadet Force in the town hall. Ten girls were chosen from the “many pretty girls present”. The judges were Lieut. H. Lucas and R. Baird, from Whitehouse Platoon. Agnes McGookin was crowned May Queen 1959. Music was provided by the Sam Wilson Band.